In today’s World INDIA has largest education system with more then 18,000 colleges, and more then 400 universities. Student mobility is now increased. Now a day’s many universities provided distance learning education to the student and due to this there is a change in the education pattern. Now education is become more career oriented. 1. 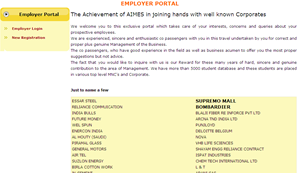 Transparency in the business from Client (Student) to Top level management. 9. And there is many more benefits which can help the institute and it's Management. 1. Web site content management .